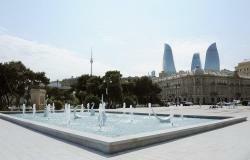 Swans fountain complex, one of the historic landmarks of the Baku boulevard, has been inaugurated after major renovation. President of Azerbaijan Ilham Aliyev and First Lady, president of the Heydar Aliyev Foundation Mehriban Aliyeva attended the opening of the complex. 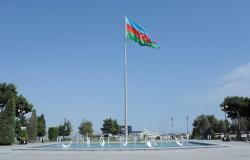 Built in 1960, Swans complex was replaced with a marble fountain installation when the Baku boulevard underwent major reconstruction in 2007. The historic complex was restored on the initiative of the First Lady, president of the Heydar Aliyev Foundation Mehriban Aliyeva. Executive Director of the Heydar Aliyev Foundation Anar Alakbarov informed President Ilham Aliyev and First Lady Mehriban Aliyeva about the restoration of the complex. The project, which was implemented with the support of the Heydar Aliyev Foundation, saw the construction of a pool, 16 fountain poles, and seven swan statues in the complex. President Ilham Aliyev and First Lady Mehriban Aliyeva also toured the Small Venetian Town at the Seaside National Park.